Its primetime for the Tennessee Titans as they finish their series of games against their old AFC Central nemeses the Cleveland Browns, Cincinnati Bengals, Baltimore Ravens, and finishing up with the Pittsburgh Steelers. The Titans are coming off a loss to the Ravens and the Steelers a bad loss to the New York Jets. On paper the Steelers are clearly the better team. They might be on the field too. Neither secondary is very good but the Steelers at least have an offense that can take advantage. The Steelers are 4th in the league in passing putting up 297.6 passing yards per game. Ben Roesthisberger cooled down against the Jets but has been on fire lately and has thrown 23 touchdowns versus 5 interceptions. Two of those interceptions were against the Jets. The Steelers run game isn’t shabby either with the league’s new version of smash and dash in Le’Veon Bell and LeGarrette Blount. Bell is the overall better playmaker than the original dash even if not quite as fast. The second leading receiver on the team, Bell is averaging 46.6 receiving yards per game in addition to 74.7 rushing yards per game. This is bad news to the Titans who are giving up 136.6 rushing yards per game. 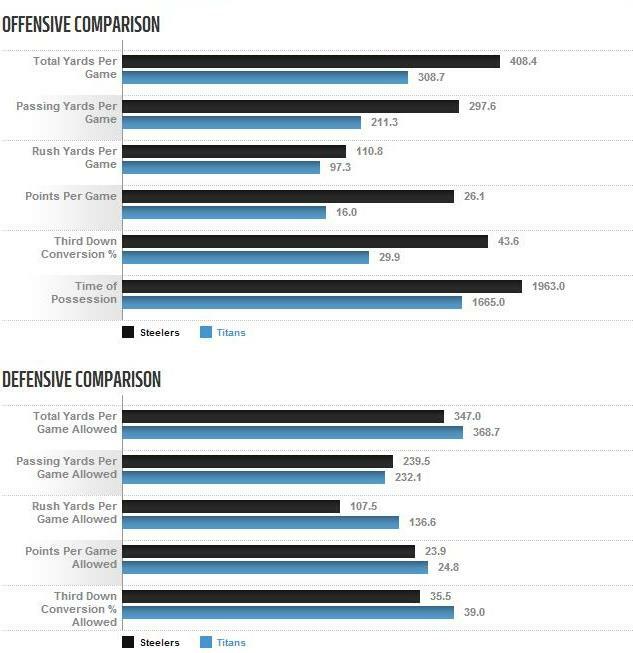 The Titans run defense is so bad that teams are opting to just play ball control which leads to a misleading stat regarding their pass defense which is ranked 11th in the league. The Titans secondary has been banged up and has given up big plays all year. It will face a Steelers receiving corp that includes Antonio Brown and emerging rookie Martavis Bryant. The Titans secondary got healthier off the bye week with the return of Coty Sensabaugh but this is a tough matchup for the group. Second year cornerback Blidi Wreh-Wilson continues to develop and will face another big test in Bryant since McCourty and Sensabaugh are likely to see a healthy dose of Brown. Brown is averaging 107 receiving yards per game while Bryant is averaging 77.5 receiving yards per game. The Titans offense has struggled but it will face a Steelers secondary that is banged up and has struggled. Safety Troy Palamalu has been ruled out and Ike Taylor is still not ready to return. The Titans were unable to take advantage of a weak Ravens secondary in Zach Mettenberger’s second start. Will they fare better against the Steelers? The Steelers front line might not be quite as good as the Ravens but it will feature a first start by former Tennessee Volunteer defensive lineman Dan McCullers. McCullers will replace Steve McClendon at nose tackle and should see some significant playing time. The Steelers have 20 sacks on the season. The Titans offensive line has been atrocious this year and hopefully will give its rookie quarterback some time to throw. Mettenberger was rattled by the Ravens pass rush and was dead weight in the pocket. The pressure got to Mettenberger who struggled to read the field against the Ravens. The Titans will be without a key compenent of their offense in tight end Delanie Walker who is expected to miss this game with a concussion. The Titans need to limit the big plays and follow the gameplan they ran across the Kansas City Chiefs in Week 1 by keeping the big plays in front of them. The Steelers wide receivers are going to make plays the Titans goal should be to keep them in front of them and from the end zone. The Titans could be without their best returners in Leon Washington and Dexter McCluster. This does not bode well as the Titans struggling offense goes stone cold when starting backed up this season. With a young quarterback getting good field position can be extremely helpful. Wide receiver Kendall Wright is the likely candidate to return if they can’t go. The two teams have met each other 76 times (including 4 postseason games), with the Tennessee Titans winning 32 games and the Pittsburgh Steelers winning 44 games. The Titans own the past two wins including a 16-9 win last year to kickoff the season. That game is notable for Titans return man Darius Reynaud stepping back into the endzone for a safety on the first play of the game. It being Monday Night Football naturally your broadcast crew is Jon Gruden, Mike Tirico and Lisa Salters. Brad Allen and his officiating crew will call the game. The weather will be quite cold in Nashville with a high of 37 and and a low of 19 with a chance of snow showers early on Monday.